Comfortable, Clean, Dog(s) Friendly, Modern Townhouse in a great location near the Beach! Walking distance to restaurants + Private parking! Beautiful Ocean Views from both the Large Living Room and Master Bedroom Private Decks ideal for Outdoor Breakfasts and socializing. Enjoy sunsets from the third bedroom private deck. Note:- Pet fee is $23.00 per night for bookings less than seven nights. Take in the sunsets on the Upper back, Private Balcony off the Back Bedroom also with Cable TV. Beautifully Furnished, Spacious unit has Full Kitchen, Separate Laundry Area next to 1/2 Bathroom and stairs up to the bedrooms, Dining area, Sleeper Sofa in Living Room which has a fireplace for Cozy winter evenings. Master Bedroom with Queen Bed, 2nd BR w/queen bed, 3rd BR w/twin beds Conditioning, Cable TV, Private Bath, Full-size Washer & Dryer; Carpeted throughout. Outside Shower, Beach Chairs & Umbrella, some beach toys, three bicycles. Private Off-Street Parking for 2 Cars in the Carport. Great central location - walking distance to restaurants, stores, boat rentals etc. The Rehoboth Beach Boardwalk is a relaxing walk on the beach or one can take the Jolly Trolley into Rehoboth Ave. which is just steps away. It is our goal to provide high quality experience for our guests. This is not just another rental property. It is our beach home. The artistic touches as well as the fully equipped kitchen reflect the comfort and our personal goals to make our home your home away for the time you stay with us. It is important to us that our guests have a great stay and every effort is made to make your vacation a wonderful and memorable experience. I handle all the bookings so that I can meet our guests and provide the personal service and attention they deserve when booking a vacation stay. I grew up on the Jersey Shore and although I was away from the ocean for a number of years, I never forgot the wonders of the beach and its atmosphere. Dewey Beach is a wonderful place and when we saw it, we fell in love with the area. It is unique in that it is not over-commercialized and the town works hard to maintain its unique spirit of a true seashore resort. We loved seeing the ocean from the living room and master bedroom upstairs as well as the open feeling of the place. It is big enough to enjoy with our children who like to stay as well. The location is wonderful in that everything is within easy walking distance and we could park our car in the carport and not use it at all while we are there. Even the Rehoboth boardwalk is an easy walk on the beach where we enjoy browsing through the alleys with all the unique shops. After a walk on the beach in the winter, it is wonderful to enjoy a cozy fire in the fireplace and to just relax or even enjoy the patter of raindrops on a rainy day as the place is a comfortable and inviting spot away from the rest of the world if one chooses. The area has so much to offer for any activity one would like to do. 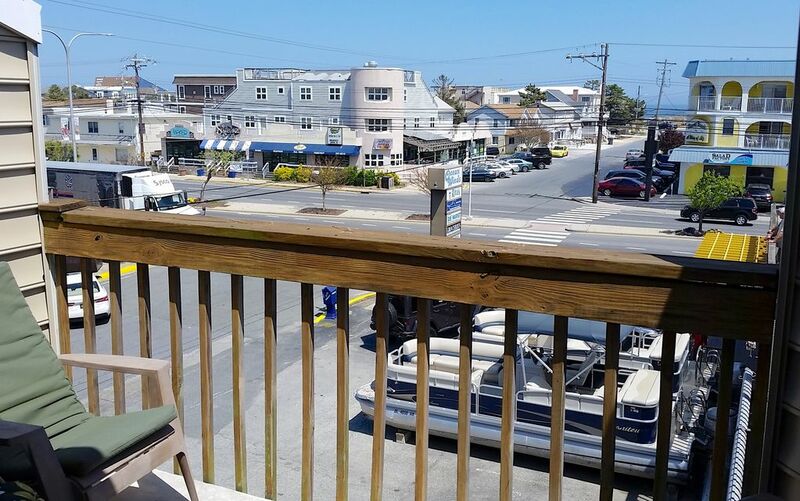 Deep-sea fishing from the Indian River inlet marina or wind-surfing on the bay or just relaxing on a wonderful beach just steps away from our place. Dewey Beach is truly an all-year, unique place unmatched by any other beach resort area. (3) Living Room Entertainment Center and Cable TV in Master and Rear BR's Plus Internet Service provided. (3) Private Master BR & LR Balconies face the ocean. Private Rear Balcony towards bayside. Carl was super accommodating and wonderful to work with! The condo was perfect for us! Everything was super clean. The location was perfect! Thank you. It is our goal for all of our guests to be comfortable and to truly enjoy their stay with us. Your compliments are most appreciated and confirm that our best efforts have been made in your behalf. Carl was super accommodating. Place was clean and had all you need. Our dog was happy with her first beach trip and we had a blast. Thank you! Our guests make a great effort to plan their vacation stays and they deserve our best effort to provide the best in service and comfort to justify their decision to stay with us. Their enjoyment is the measure of our success. Charming condo in the heart of Dewey! Easy walk to beach and anything else we needed. Clean, spacious and comfortable for our party of 6! Plenty of room in the common area and quiet and comfy sleeping upstairs. Especially nice to have 2 parking spaces, all linens (except beach towels), beach chairs, bikes and a handy buggy to carry to the beach! Great communication with owner throughout process. Highly recommend. Would stay here again! Wonderful location! Clean, roomy. Owner is super responsive and nice!! We had a great time for our girls weekend! Thank you so much for staying with us! It is always great when our guests enjoy themselves like you. It is important that our guests enjoy a special time for their vacation and we want to do everything possible to that end. Thank you very much. We look forward to yur return. We highly enjoyed our stay. The only issue was the wifi was not operational and the TV only got four channels. It appears the owner doesn't pay for these amenities in the off season. The wi-fi information is provided in an email along with my cell number for all our guests before their arrival. This is the first time we have ever encountered this situation. We are sorry about the TV, but I am always available to help our guests at anytime. I wish they had called me right away so that I could resolve any issue. If paying by Credit Card, an additional fee of 2.5% of the total amount will be charged. Includes linens.